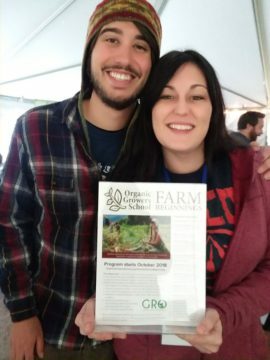 Organic Growers School and Growing Rural Opportunities Partner on offering Farm Beginnings® Farmer Training in Western NC. – Applications Open! Organic Growers School’s Farm Beginnings® Farmer Training is partnering with Polk county’s Growing Rural Opportunities (GRO) in 2018- 19 for our year long farmer training. Organic Growers School has graduated 36 farmers in the last 2 years and will graduate 50 by September 2018. Farm Beginnings® Farmer Training is a 12-month training that uses a mix of farmer-led classroom sessions, on-farm tours, and an extensive farmer network, tapping into the knowledge of the most innovative & skilled farmers in Western NC. According to current student, Nikki Hamblin, who is developing her urban farm business, Big Hava, with her partner Jess Critchlow, “ Farm BeginningsⓇ has help me to articulate my goals, short term and long term. Nicole (DelCogliano) and the course have helped me to be more methodical and see the value of each step along the way.” Jess and Nikki plan to launch their farm business in the next year, after their mentorship with Eileen Droescher of Ol Turtle Farm, who has over 20 years of farming experience here and in the Northeast. Farm Beginnings® Farmer Training is designed to offer beginning and expanding farmers the practical skills and knowledge needed to start and grow successful long-term farm businesses. With a focus on sustainable agriculture practices, the course is taught by established farmers and agricultural entrepreneurs from across Western NC, such as Balsam Gardens, Beacon Village, Against the Grain, Green Toe Ground, Rayburn Farm, Bluebird Farm and A Way of Life Farm. The course is open to aspiring, beginning and expanding farmers in Western NC and surrounding Southern Appalachian states – Tennessee, Virginia, Georgia, and South Carolina. Farm BeginningsⓇ Farmer Training was developed to address the needs of the regional farming community and offer a comprehensive farmer-led training course to better prepare the next generation of farming professionals in Western NC. 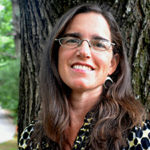 It is a part of the national Farm Beginnings® Collaborative, recognized as “a model that is creating strong new farm businesses across the country” by Kathleen Merrigan, former U.S. Deputy Secretary of Agriculture (in her 2012 remarks to the Beginning Farmer and Rancher Development Program directors). The one-year farming training program consists of 200+ hours of training time including: 60 hours of whole farm business planning sessions; 45 hours of production training through field days on sustainable farms around WNC and on the Southern Appalachian Highlands Conservancy Incubator Farm; 40+ hours of classes at Organic Growers School’s Annual Conferences; and 8 hours at ASAP’s Business of Farming conference. The mentorship component adds an additional 15+ hours of one-on-one guidance from an experienced farmer mentor.